AMMAN, Jordan - March 11, 2018 - PRLog -- but also with extreme sportiness, so it perfectly captures the dual personality inherent in the Maserati DNA. From this concept, Nerissimo was born − a special edition of Maserati cars that emphasises their assertive sporting prowess and high-performance capabilities. For the Ghibli and Quattroporte, a dark finish on the LED headlights and a choice of either 20" Urano or 21" Titano alloy wheels – both in glossy black – complete the picture. The Levante offers additional features such as front and rear underbody protection and black fog light rings. It is available with a choice of 20" Nereo, 20" Efesto or 21" Anteo alloy wheels – all in dark finishes. The Marque of the Trident's other models will also be present in Geneva in a variety of trims and colours. This includes a Ghibli S Q4 GranLusso Bianco Alpi with 20" Urano Diamond wheels, polished aluminium brake calipers, a luxuriously elegant Ermenegildo Zegna silk interior with red leather, 100% natural fibre Mulberry silk inserts and a high-quality Ebony trim. The Quattroporte S Q4 GranLusso is presented in Blu Passione, with 21" Titano wheels and black brake calipers. The exquisite beige leather interior with wooden inserts perfectly matches the exterior, and the two rear seats ensure maximum comfort for executive use. The sports cars are represented by the GranCabrio MC. Painted in Bianco Birdcage, the cabriolet features 20" wheels, black brake calipers, a leather and Alcantara interior, and contrasting white stitching that embellishes the passenger compartment. The carbon detail also reinforces the car's strong racing look. 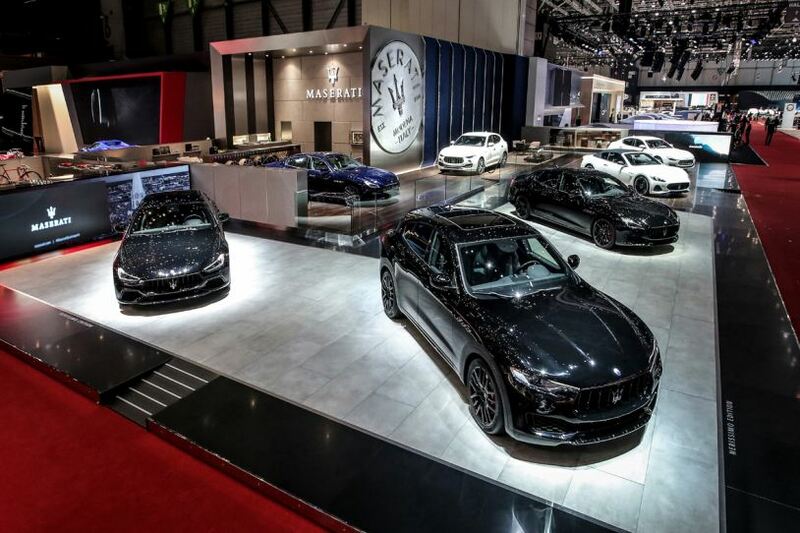 The Ghibli is the highest-selling car in Maserati history, with over 84.200 models delivered since 2013. The MY18 has Adaptive full LED Matrix headlights with "Glare Free" technology, developed in collaboration with Magneti Marelli Automotive Lighting. The Quattroporte MY18 has also introduced Adaptive full LED headlights on all trims, with standard L-shape"Glare Free" technology that provides longer-lasting, more natural light with substantially improved visibility compared to Bi-Xenon technology. A particular highlight from among the important technical innovations is Electric Power Steering (EPS). This facilitates the active functions of the new Advanced Driving Assistance Systems (ADAS), which include Highway Assist (HAS), Lane Keeping Assist (LKA), Active Blind Spot Assist (ABSA) and Traffic Sign Recognition (TSR). EPS has replaced hydraulic steering on the two Maserati sedans and on the Levante, improving the cars' handling and comfort, while maintaining the excellent manoeuvrability typical of every Maserati. The "Maserati of SUVs" was designed to excite sports car enthusiasts, and it accomplishes this goal with its extensive use of lightweight materials, ideal 50:50 weight distribution and the lowest centre of gravity in the segment. The Levante boasts incomparable agility in the luxury SUV segment, as well as extraordinary comfort on rough terrain and excellent road-holding on low-grip surfaces.